The initial watercolor sketch was done with a sweet little travel palette made by Winsor & Newton with Cotman half pan paints inside. I then added some strokes of various Neocolor crayons by Caran d’Ache (which would probably be the art supply I would save first if there were ever a fire here, they’re just so darned vibrant, creamy and versatile), liquified them, and refined with a bit more pan watercolor paint, and some Liquitex Gesso. My old friends, the Golden fluid acrylic paints (vibrant, luscious paint the consistency of heavy cream) rounded out the painting. Note: As a Blick Art Materials affiliate, purchases from these links help to support my site and a fledgling art business. Enjoy, and thank you! Once again, this was quite a journey, and when it comes to abstract painting, I hope the journey never ends. I think the biggest thing I’ve learned so far from the first third of the first annual World Watercolor Month is that I may be a realistic artist when drawing, but I’m an abstract painter. And I’m loving it. I hope you are, too. Everybody should have a little “strawberry field where nothing is real” in their life. Escape with art and recycle stress into strength! Have a wonderfully productive and peaceful week. Wonderful stuff! This really works beautifully. good job Laura! your colors, your style, your way!! Thank you so much, Debi! My magenta had to lighten the mood for me after the last one lol! Oh this color combo! Love it! I prefer abstracts too probably because I can’t draw 😂. Thank you, Steven, really glad you like this one. I was finally happy when I completed this one last night. Nice to go to sleep knowing you created something that pleases you. I am sure you know what I mean! Thanks for stopping by and giving your feedback, it’s much appreciated. Have a great week! I always imagine things differently than they turn out myself. But I like to be surprised too. I like what you’re discovering! Thanks, Kerfe. I imagined a really nice, plain and simple realistic flower and got a five year old’s painting. Just not wanting to post stuff like that anymore so I tried to make lemonade. So far from WWM I’ve learned that I really like to combine WC and acrylic and gesso in one painting. And at least I’m more comfortable with WC than I was last July when I painted in it all month. So it’s all good, I guess. I never thought I’d be an abstract anything, but I guess since I come from quilting it makes more sense than not 🙂 Always appreciate your insights. I can’t escape the influence of quilts either! “Everybody should have a little strawberry field where nothing is real in their life. HOORAY for that! We all need – and this beautiful painting is SO that! Luscious, vibrant strawberry field laura loo style! Superb! AMEN to that! And if that is achieved – it matters not if our art is realistic, abstract, semi-abstract, impressionistic….. whatever! Jodi thank you for shining your light!!! I’m sure your coworkers and customers are blessed by your presence in their day, no matter how that presence is felt. I really appreciate your feedback. Debi was so right on today, is she amazing? Not that I’m saying anything new lol. Thanks Nista, you da bomb 💜 I really need to get my abstract groove on. Still trying realism here and there but loving the ability to really express the way I feel about the flower in this painting. Oh, have we. Throwing brushes and all. lol!! Thanks Jodi. The zenartistanista!! I wish all of your nicknames weren’t longer than your actual name lol. Lol I’ll have to look that one up Kathy! Thank you Sissh and the feeling is mutual!! Luscious colors! I can hear the joy you have making this kind of art. Thank you! I appreciate that very much! Margaret, I just love you. Thank you. You and Debi are like little guideposts for me, well, big guideposts! And Jodi is really helping too, you all seem to see the zen in the process. Grief and sadness led me to abstracts last summer. My cat became very ill and passed, and she was our last kitty. She was so close to my heart. I bet if you click on my Abstract category and go to the first ones, you’ll see my journey there with lots of me trying to get peace by picturing myself at the edge of a lake and playing with the Neocolors I had just purchased when she got sick. awww……losing a family pet is so very hard, I have been through that many times. Out of pain and grief, your abstracts have risen….now isn’t that the way of art? true, spirit touching art? I think that is where art can impact another person’s life, it came with a whole lot of living and feeling. Hi Laura, lucky us that the pink cosmos painting didn’t work for you and we got this beautiful abstract instead. I love all the layers of color in this. Thank you, Carol! I had so much fun with this once I looked at that realistic flower and said yuck to it. Then it was all good lol. The neos really helped add effortless color and then the watercolor and acrylic came into play too. I just love mixing it all up! You are very much abstract with your painting. Your feel for color is so cook. I enjoy seeing your combinations. So early in the morning…I meant to say “your feel for color is so good” although you do cook things up with color! Thanks, Carmel. I really enjoy playing with color, it’s like quilting without the machine and pins. Beautiful and striking image, Laura! 😍LOVE your abstracts, so I’m thrilled to know you’re loving them too! Just be beautiful YOU! It’s what we all love coming to see! Thank you! I’m really working on composition. I appreciate that. I think we go through periods in our lives where we are drawn to certain art forms. 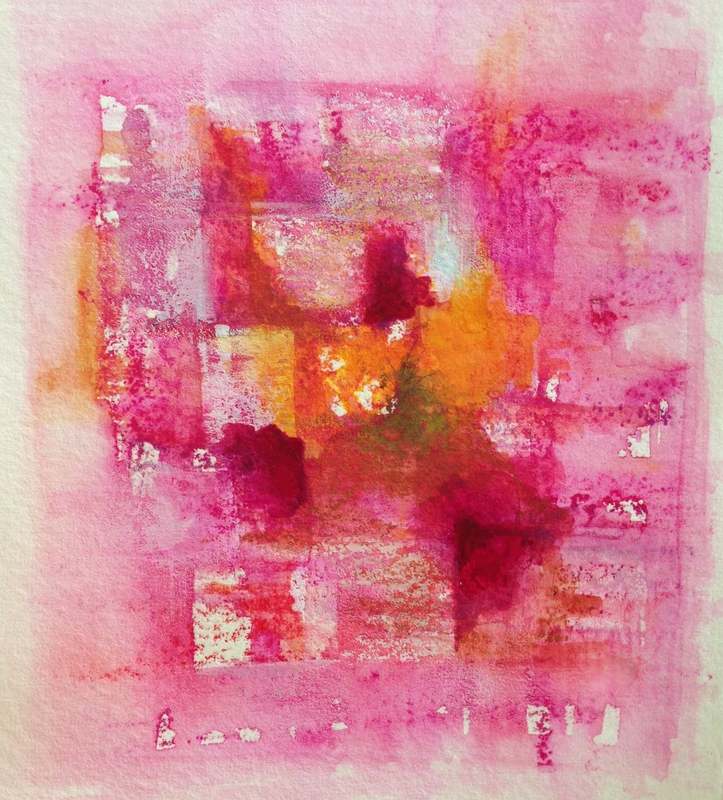 I love that you are creating abstracts and enjoying them, Laura! 🙂 You are so good at them too! ((((Laura)))) PS – love the pinks!! Thanks, Jill; I’m glad you think so, it feels like who I am in art, but I feel like that changes. Maybe you’re right, and in a year, I’ll be into something else totally? But I feel like last summer, I was thinking abstract realism and I still feel that most of the time, I’m in that ballpark a year later. I think of these as making a quilt, but much faster, and without trying to find that perfect fabric. You know? Less frustration. Maybe it is a seasonal thing for you? I go through periods where I enjoy some art forms more than others. Part of my influence is how much time I have to create. Summers are busier for me so I look for quicker projects. I just think it is interesting to look back on my art and see what was going on in my life at the time to influence my art. Guess I’m weird in that way! 😜 Lol! Fabulous image today Laura, color, texture and depth speak loudly. I love this a lot Laura, the way it is blended out works fantastically well….oh I have ordered Aqua and claybord 😀 Time to get the real thing, if I was in the us, I would have used blick! Thanks so much, Rebecca, you’re so sweet! I’m looking forward to seeing what you do with both. I hope they didn’t cost a small fortune! I just love Derwent products; if I lived in England I’d be visiting the factory (if they allow visitors)!